So it's been a busy bit of the year. Lots of things going on, and unfortunately, I've spent less time in the kitchen than usual. But it seems to be coming around. 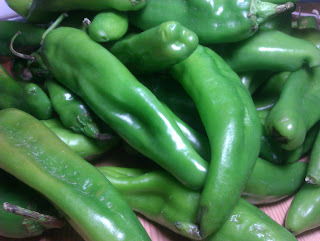 It is the edge of Fall, and back home in New Mexico, this means it is green chile harvest time. All the stores get piles of green chile, most from the big chile farms in Hatch, NM, and you'll see roasters all over the place. Roasters? Well.. yes. You can buy chile by the bushel, and often, they will roast it for you on the spot. But why would you roast green chile, you might ask? Unlike many other peppers, the green chile comes with a thick waxy skin that really isn't edible, and at best is very difficult to chew. So by roasting them quickly over high heat, the skin blisters and separates from the flesh of the pod, and you can peel it and then do what you want with it. Fortunately for me, New Mexico Hatch green chile has become somewhat of a phenomenon in the United States, and you can find it out and about. Whole Foods here in the Seattle area has begun carrying it fresh, and local artisans have already started taking advantage, including some delicious green chile cheddar cheese I've found. Wonderful stuff. So I think my next few entries will focus on this wonderful pepper and its place in my life.